WELCOME TO MID-VALLEY AUTOMATIC FIRE SYSTEMS, INC.
At ﻿﻿Mid-Valley Fire Systems﻿﻿ we are proud of our excellent history of reliable and timely service work in the fire industry. Our goal is simple: to provide fast, professional service at competitive prices. 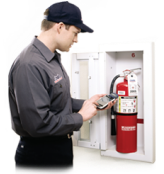 Whether you are starting a new business or just need an inspection, we want to be the fire service company you call first. No job is too large or too small for Mid Valley Fire Systems. Our highly skilled service team will assess your needs and discuss your options with you. Our mission is to provide, reliable, quality, service to minimize the risk of life or property loss due to fire. "One Call Does It All..."